Candidates can submit online application forms for NEET (UG) 2019 on the NTA website at http://www.ntaneet.nic.in. Online application submission extends from 01/11/2018 (Thursday) t0 07/12/2018 (Friday). Check latest NEET 2018 notification. NEET Results 2018 has been declared in the CBSE website on 4th June 2018. Now, find more information about NEET Results- Important details. CBSE has published the NEET 2018 Cut off with the results. This year, NEET Cut off is lower compared to previous years. Here, you can find the detailed analysis of the NEET Cut off score 2018. Now, check NEET Cut off 2018, 2017 – Category wise marks for Unreserved, OBC, SC, ST & PH. NEET 2018 Results- How to Predict/ Estimate? Now, NEET 2018 results are expected to be declared on 5th June, 2018. Now, check how to predict/ estimate NEET 2018 results. And, see how to calculate NEET 2018 results by checking NEET OMR sheet and NEET Answer key for 2018. NEET 2018 Answer Key released. NEET 2018 Answer key and OMR responses displayed at CBSE website from 25.05.2018 to 27.05.2018, 05:00 pm. Check here for NEET 2018 Answer key and OMR responses- Important instructions. Candidates can find latest NEET 2018 News/ NEET 2018 Notification here. CBSE is expected to release NEET 2018 Answer key soon. Check for more information about NEET Answer key 2018 here. Also, NEET 2018 results are expected tentatively on June 5, 2018. Meanwhile, check how to predict your NEET 2018 results here. NEET UG 2018 will be held on Sunday, 6th May 2018. Also, NEET Notification about NEET 2018 Application process has started on February 8, 2018. Now, check here to find more information about NEET 2018 Application- Date, Website Link & Required Documents. On 25th January 2018, CBSE has informed Supreme Court that the NEET 2018 Question Paper will be uniform across all languages. Last year, many candidates complained that NEET 2017 Question paper was different in different languages. Also, some candidates thought that the NEET Question paper In regional languages were more difficult than the one in English. And, this led to a public outcry against the lack of uniformity in the NEET Question paper in 2017. NEET PG 2018 Results announced! 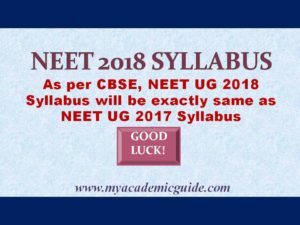 As per the latest CBSE NEET notification, NEET UG 2018 Syllabus will be exactly same as NEET UG 2017 Syllabus. Now, check here for the NEET 2018 Syllabus- Physics, Chemistry & Biology Topics. Every year, thousands of students enroll in the National Institute of Open Schooling (NIOS). There is still much concern about the eligibility of Class 12 candidates from open schooling to take NEET 2018 Exam. Further notification is expected soon from Medical Council of India (MCI) regarding this. While waiting for additional CBSE NEET notification and CBSE NEET news, candidates can take additional steps to prepare for NEET 2018. Check for additional details about NEET 2018 preparation- Important Steps here. NEET News- Will NEET improve the Quality of Medical Education in India? NEET, being the common Medical Entrance Exam in India, has brought more transparency and uniformity in MBBS/ BDS admissions. Now, the big question is this? Will NEET help to improve the Quality of Medical Education in India? Check here for the complete article. How to Avoid Negative Marks for NEET? Candidates often worry about negative marks for NEET. Every year, many students fail to get better marks for NEET because of blind guessing. However, candidates can employ intelligent guessing to minimize negative marks for NEET. Now, read more about Intelligent Guessing here. Find ways to avoid negative marks for NEET. Preparing for NEET involves more hurdles than subject preparation. Additionally, candidates are required to use effective test taking strategies. Check here to find top 10 NEET Tips by NEET Toppers. Every year, NIRF provides rankings for the top Medical Colleges in India. Check here to see the latest NIRF rankings for the best Indian Medical Colleges. Do you stress yourself out while preparing for NEET? Then, avoid NEET stress by exploring fun ways to prepare for NEET. Now, find more about NEET Jokes- Explore Fun Ways to Prepare for NEET. As you are aware, even minor mistakes on the NEET Exam day can cost you marks. See how to improve your NEET score by avoiding mistakes on NEET Exam day. Now, see the full article- Avoid Mistakes on NEET Test Day: Top 5 Mistakes by Toppers. 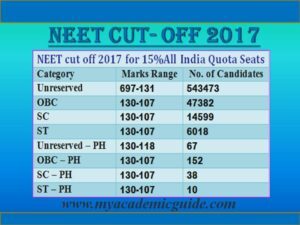 Candidates should be aware of the NEET Cut off 2017, category wise for 15% All India Quota Seats. Now, click here to find NEET Cut Off marks for Unreserved, SC,ST,OBC and PH categories. Also, read NEET Percentile: NEET Qualifying Marks for General, SC, ST, OBC & PH Categories. And see, Will NEET improve the Quality of Medical Education in India? Additionally, check for Scholarships to study in India / Abroad. Finally, visit http://www.myacademicguide.com/for more NEET Notifications & latest NEET News and NEET updates.